The marine instruments of the WEMPE SKIPPER Series are technologically up-to-date and deliver a good performance on land and at sea. 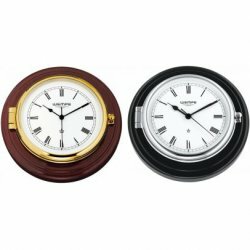 The design is appealing even to customers who would like to enhance the looks of their offices or living rooms with clocks in maritime style. The SKIPPER Series is perfect for this purpose; embedded in wooden boards, the instruments have an exclusive appearance. There are two instruments at choice: The ship clock with Roman numerals has a battery-powered quartz movement that precisely shows the time. The barometer measures the atmospheric pressure in hPa. Both WEMPE SKIPPER instruments have either a lacquered and polished brass enclosure fixated on a high-gloss polished mahogany board, or a chrome plated enclosure on a wooden board of piano varnish. The total diameter amounts to 210mm, of the white clock face takes up 140mm.